4.2 out of 5 based on 139 bloggers and 39 commenters. 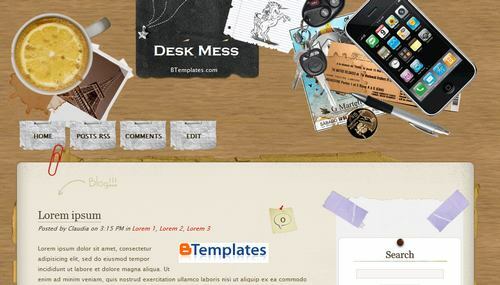 Desk Mess is a free blogger template adapted from WordPress with 2 columns, right sidebar, fresh look, rounded corners and grunge style. Excellent template for blogs about desktop, internet or photography. I’m trying to upload this template, but the images won’t load onto the page. Are there any special instructions I need to know about. I have tried uploading several times to no avail, blogger offers no support and I am in love with this template. That’s true, sorry maybe i’m still a newbie, how to upload the image files? Thanks for this template. I really like it. But can i know how can the date of the post shown? 3. Under Settings, go to the Formatting Tab. 4. You could put change the date/time in your Timestamp Format. 4. Choose the destination. It would be more easier if you had putted it in your desktop. 5. If the extraction is done, close the window and go to your desktop. 6. Double Click the Desk-Mess folder. You will see another Desk-Mess folder inside. Double-click it. 7. You could see 2 icons. Right-click Desk-mess.xml. 9. You could now see the raw document. Copy it. 10. In your blogger account, go to Layout > Edit HTML. 11. Paste the XML Document in the workspace. 12. Some page elements must be deleted. If you are asked to delete them, confirm delete. If not, that’s better. 13. Ready to view your blog! How can I change the linked tabs at the top of the page. In stead of “Home”, “Post RSS”, “Comments” and “Edit”, I’d like it to say “Home”, “Info”, “Contact”, etc…..
Well, the template is great, but it doesn’t show the date. And what you said to mintoro – it’s not working. I have changed the date/time in my timestamp format for several times and it’s still not working. So, can you help me please ? How do I add profile informaion about the blogger? Including photo? my problem, same as selena. how to fix that? please tell me! I did all that stuff you said, but nothing happened to my blog…when i said ‘preview blog’ it was my html on the webpage … what’s going on? My only prob which I overlooked is the date. I’m trying to play around the codes but it didn’t help me. Anyone who’s got the solution here? Hi Guys, Im really really new at this. i got this layout to work on my blog, but I have some concerns. How exactly do the comments works for this? Like will people be able to leave a comment, i cant seem to find any link for it, except for the comment tab at the top, which doesnt seem to want to work? Also, would ppl be able to leave a comment per post? i see the sticky note with 0, but i dont kno how to tell ppl to leave a comment & where. In case you guys or anyone else is still trying to figure out how to display the date in Desk Mess template for Blogger, I think I’ve figured it out. Go to Layout->Edit HTML->Expand Widget Templates. I had also changed my date format to July 31, 2009 before I did this (as I was trying some of the suggestions above), but I don’t think this is important or made a difference. I hope this helps! No guarantee that it will (I don’t actually know HTML beyond fiddling), but if you check my page I use the Desk Mess template and it worked for me. Thank you for this beautiful template :). I absolutely love it. How can i delete my pots that in Posts RSS? Need the answer urgently. Thank! For the life of me I could not get the code that Sal posted to work. After trial and error (and a lot of web research), I realized the problem. If you copy and paste the code that Sal wrote (which is entirely correct! ), the quotes will be italisized. So you have to go in and just retype the quotes (‘) around ‘data:post.dateHeader’. Just delete them and retype them. After that it worked for me!!! Sal-can you help me change the edit tap at the top to “about” like you have on your cool site. Thanks for the HTML date code-it worked! I appreciate your knowledge and help. Sorry, I didn’t see this until now — but I’ve see you’ve figured it out! I’m glad! Great! Kudos to all:)..This template was awesome. I need help editing the Tabs (navigation bar?) from POSTS RSS, COMMENTS, & EDIT into links for my other blogs. Thank you SOO MUCH to Sal and Steph! I just notices that the dearch button does not work. I tried adding a custom Google search engine from here(http://www.google.com/cse/) but the engine does not return any results. It says “No posts found for this query”. I then tried adding the Blogger navigation bar and using that search button and it did not return any posts either. Is there a problem with search engines recognizing the tags i use in my posts? Can you send a template with a third column? Or the html to add it? Love the design… I’ve got a similar one for my blog, but I want to utilise the way you’ve done the number of comments each post has received in that little speech bubble on the top right – how do I do this?!? I’ve tried comparing the code, but to no avail. If you could help, I’d really appreciate it. Hi im new in this and i don’t know how to put a template in my blog cud you please explain to me how o uploading a video tutorial?? how to add ‘Read More >>” in this theme? I absolutely love the template! My only problem is that, comments are not being displayed in the blog. Whenever a user enters a comment, press Publish, then nothing happen. Please, somebody help! Thank you very much. I shall be thankful to all human who accept of Allah and Mohammad(SSAW) and follow the life to his creater . Please take care to parents all time.